Crisp and juicy SweeTango apples add fresh fall flavour to this simple breakfast dish. I’ve been making an effort to eat better this year, but it hasn’t been easy. I managed to get my dinner routine in place fairly quickly (protein + carb + vegetable dish), but trying to eat healthy at breakfast and lunch has been much more challenging. I tried buying healthy sugar-free cereals, but frankly they aren’t very tasty. So instead, I’ve found myself turning to oatmeal (sometimes instant, sometimes steel-cut), with healthy toppings. 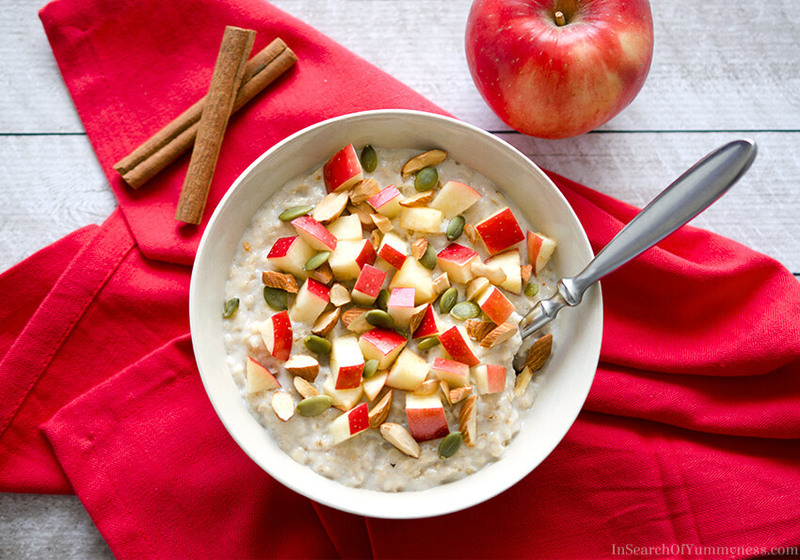 One of my favourite combinations is cinnamon brown sugar oatmeal with apples! This Apple Oatmeal Breakfast Bowl is super easy to put together, which is great because I’m generally blurry-eyed and grumpy first thing in the morning. If you’re not a morning person, but you want to eat something tastier (and more filling!) than cereal, you need to try making this recipe. You’re basically just making instant oatmeal, and chopping up an apple! Since this recipe is so minimal, it’s important to use the best apples you can get your hands on. I’m a big fan of SweeTango apples, personally. I’ve been talking about this special apple variety for a couple of years now, and they continue to be my favourite apple to eat raw. Last year I shared a recipe for apple sandwich snacks, which you should definitely try because they are delicious! So what makes SweeTango apples so special? Well, this particular variety of apple combines the best qualities of sweet Honeycrisp apples (my old favourite) and tangy Zestar! apples. These crisp apples are perfectly crunchy, and have a great balance of sweet and tangy flavour (making them great for eating raw). SweeTango apples are in season from early fall to mid-winter, so be sure to look for them in your grocery soon! I’ve developed this recipe in partnership with SweeTango apples, so please visit SweeTango.com to get the full list of ingredients and instructions. SweeTango’s Share the Crunch Contest! How do YOU share the crunch? Show how you Share The Crunch of a SweeTango apple, you could win $1,000, and have $1,000 donated to your local food bank! But, the sharing doesn’t stop there! Forty second place winners will get a 6-pack gift box of SweeTango apples shipped to their door! To enter, share a photo, video or story showing how you Share The Crunch on Facebook, Instagram, or Twitter, and hashtag it with #ShareTheCrunch and #Entry. You can also enter online at SweeTango.com. Once posted, tell your friends! The entry will be open to voting through November 1, 2017 and the entry with the most votes will win the Grand Prize! Share what you love and do good for your community! One grand prize winner, determined by the entry with the most votes, will receive a $1,000 cashier’s check and SweeTango will donate another $1,000 to a food bank in the winner’s hometown or community. Each Monday during the contest period, the folks at SweeTango will select five entries at random to win a 6-pack gift box of SweeTango apples fresh from the orchard and send them right to your door! Second place winners are still in the running for the grand prize. Open to residents of Canada (excluding Quebec) and the United States of America. This blog is not affiliated with the Share the Crunch giveaway. I have no control over the outcome of this contest. Oatmeal is my absolute favourite fall breakfast. This version looks delicious! Thanks Dara! It’s so simple, but very tasty. I hope you give it a try! I discovered SweeTango apples last year and they’re so delish! Oatmeal is a favourite around here — specially when it’s infused with apple and cinnamon flavours. I’d love to enjoy a bowl of this for Saturday breakfast! Have a great weekend, Shareba! I am from the Okanagan and grew up with apples everywhere! I have never heard of SweeTango apples but now I need to hunt them down and try them. Isn’t oatmeal and apples such a comforting food! Makes me feel cozy and think of fall. I haven’t been to the Okanagan but I’ve heard it’s beautiful there! I hope you can get your hands on these apples, they are so good! Let me know if you need help tracking them down!